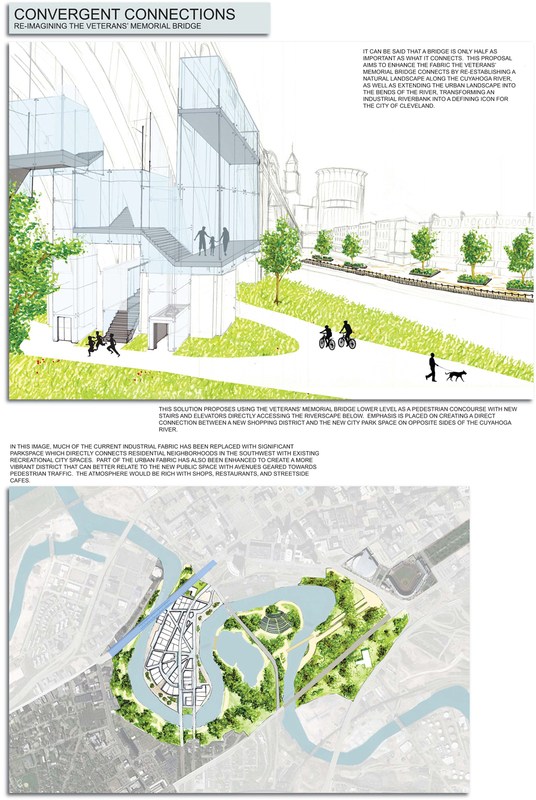 Overview: This design proposal looks at the conditions of the Veteran’s Memorial Bridge and its surrounding context. The bridge is a beautiful classical design, surrounded by what appears to be a void space of industrial situations, and a polluted river basin. 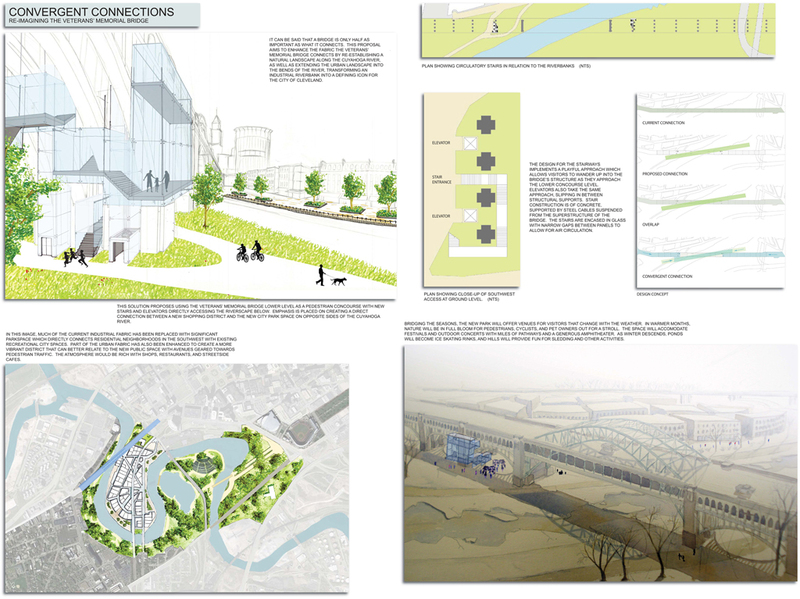 In order to better frame the bridge in a context that suits it, we propose re-establishing the natural landscape along the Cuyahoga river in the immediate vicinity of the Veteran’s Memorial Bridge, and surrounding residential fabric, as well as the major sporting venues a short distance away. We also propose enhancing the “finger” of urban fabric adjacent to the bridge to support shops and restaurants. This new enclave would serve as a perfect bridge between Downtown, and the greater Cleveland area. 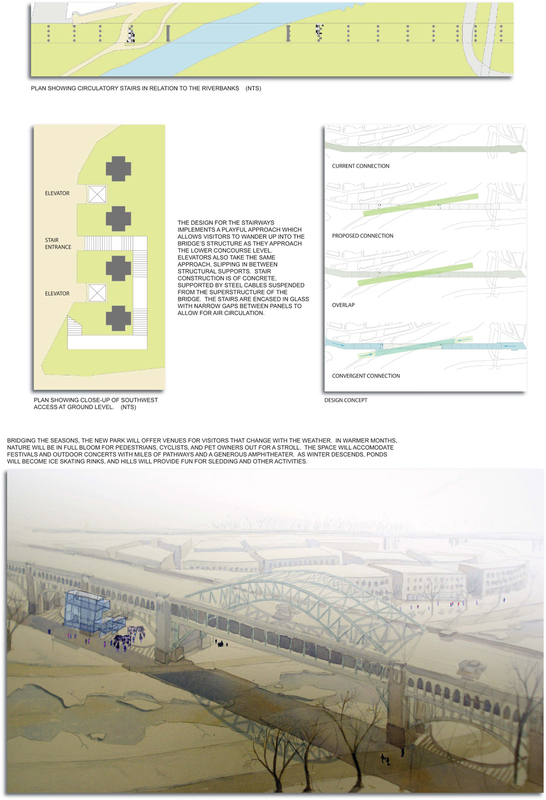 It would also provide a destination for recreation and relaxation for Cleveland’s residents. As New York City, Boston, and other major metropolis’ have their iconic green spaces in the heart of town, we believe that an opportunity exists for the city of Cleveland to join the ranks with a definitive urban, and natural experience.